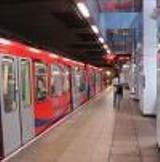 The Mayor of London, Boris Johnson, officially unveiled the £180m extension of the Docklands Light Railway, from King George V to the new Woolwich Arsenal station on the 14th January 2009. The 2.5km extension was designed and built by Morgan Est/Colas Rail joint venture with Halcrow, and was completed two months ahead of schedule. 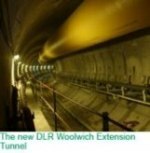 project included twin 6m diameter bored tunnels under the Thames plus diaphragm walls, station construction, mechanical and electrical works, track work, signalling, communications and associated rail systems. The project also includes a 15m diameter, 40m deep intervention shaft and headhouse, which accommodates power distribution and communication systems. It took three-and-a-half years to complete. Southdowns was commissioned in 2005 to assess groundborne noise and vibration from the scheme on behalf of the design and build contractor, resulting in the design and specification of mitigation measures in the form of resilient track systems. In October 2008 Southdowns was appointed to undertake ground-borne noise and vibration compliance monitoring during a scheduled System Performance Demonstration (SPD) as part of the commissioning phases of the project. •	fully floating track slab.